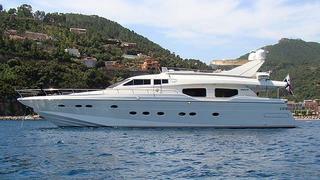 Oceanstyle by Burgess tell me that the 25.5m motor yacht Du Ciel is now sold with the buyer represented by Seanergy. Built by Cantieri Navale Rizzardi in 1998, Du Ciel is a Technema 80 in first class condition following a refit in 2007 which included a total flybridge and aft deck restyle. She boasts a light, contemporary interior with accommodation available for eight guests in four luxurious cabins and is capable of speeds of up to 32 knots. Du Ciel was asking €650,000.